Replacing a legendary coach at any club is a difficult task for any coach. Replacing Jurgen Klopp at a club with as passionate fans as Borussia Dortmund is even more difficult. That however was the task facing Thomas Tuchel when he agreed to become the latest coach of Dortmund. Known more as a tactical thinker than motivator his style with the players, fans and media is noticeably different to that of Klopp who possessed the personality to draw more and more fans to the club through his honest interviews and his touchline behaviour. There have however been numerous reports from individual players of the lengths that Tuchel has taken to improve them as individuals with Henrikh Mkhitaryan in particular praising the young German coach for his technical approach and instruction. Dortmund have certainly impressed under Tuchel has installed more of a possession based methodology at the club replacing the full throttle counter pressing of Klopp and the club has continued to recruit some of the top young players in world football. With his exceptionally young and gifted side results have been somewhat inconsistent but certainly not disastrous. This clashes with the image of Tuchel portrayed by large sections of the German media who seen intent on pursuing an agenda against the young coach who is not known for his comfortable relationship with sports writers. The 4-3-3 structure favoured by Tuchel seems to fit the playing personnel perfectly with Julian Weigl continuing to impress as the single pivot or controlling midfielder at the base of the midfield and French attacking prodigy Ousmane Dembele showing his versatility as he plays across the advanced midfield positions and even at times in a pure attacking role. This match saw them come up against a VFL Wolfsburg side that could also be said to be failing to live up to expectations. The sale of Julian Draxler to PSG in the winter transfer window was offset by the signings of both Yunus Malli from Mainz and Riechedly Bazoer from Ajax have strengthened the squad but they are still struggling to reach the European qualification places in the league. The Swiss international goalkeeper Roman Burki started the match for Dortmund behind a back four of Lukas Piszczek, Matthias Ginter, Marc Bartra and Marcel Schmelzer. In midfield Julian Weigl and Gonzalo Castro were in traditional roles with the aforementioned Ousamane Dembele also being played in a central position. Andre Schurrle and Marco Reus were wide with Pierre Emerick Aubameyang retaining his place as the lone striker. As a coach Tuchel is known for using a variation of positional play to progress the ball forwards through the thirds of the pitch. They are coached to connect in with one another using vertical corridors to position themselves at varying levels up the field to ensure that the man in possession of the ball always has two or three options to shift the focus of the attack should they come under pressure. This style is reminiscent in terms of pattern of play with what we saw over the last three seasons from Pep Guardiola when he was in charge at Bayern Munich. This should come as no surprise as Tuchel is known to be a big admirer of the Spaniard’s coaching methodology. In this example Dortmund have comfortable possession just inside their own half as they look to progress the ball up the right hand side of the pitch. 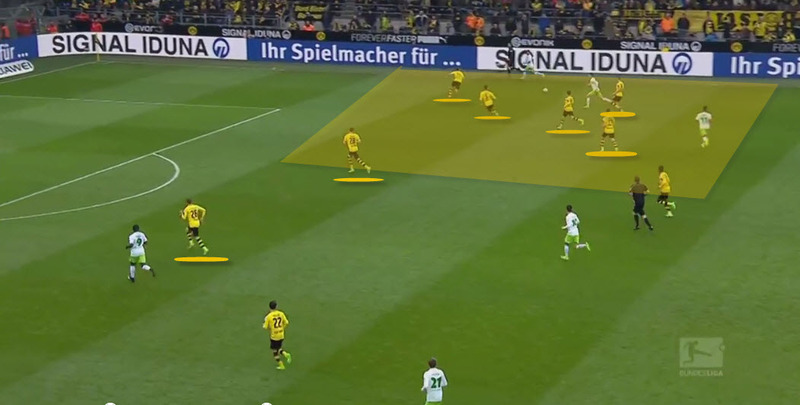 There are five Dortmund players arrayed in advanced areas in front of the man in possession. The positioning of these five players is no accident as they look to occupy three lines at different depths on the field. Whichever of the advanced players the ball is played in to they should immediately have options to play the ball off and play through the Wolfsburg defensive structure. The scenario above is again similar to what we have already seen with Dortmund enjoying comfortable possession just inside their own half of the field. Once again there are five players in the final third of the pitch and again they are structured in such a way that they are taking up different lines and depths in the final third. This has an effect on the defensive structure of the opposition who will find themselves pulled out of position if they try to man mark the attacking players. Note as well the positioning of Dembele in the centre of the structure close to Aubameyang. The French attacker is in an extremely dangerous pocket of space that he can exploit should the ball be played through. One of the most common tactical concepts in football dictates that when out of possession and in your defensive phase you should look to drop in to a compact shape to deny your opposition space as they look to move in to their attacking phase. You should then expand in transition to ensure that you cover as much of the field as possible to make it difficult for the opposition to defend against you. A relatively simple concept but still one that not many teams do really well and efficiently. The fact that Dortmund are as strong as they are in both phases of play speaks highly again of the work that Tuchel and his staff do on the training pitch. Here Dortmund are in their defensive phase with Wolfsburg attacking down the right hand side. 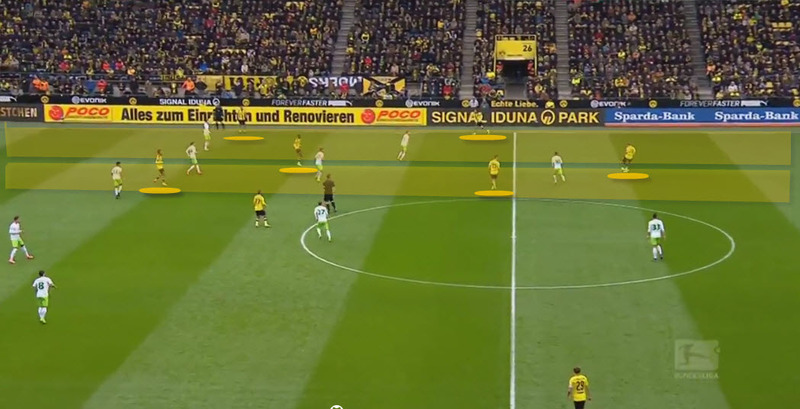 As you can see Dortmund are compact in their structure despite moving over to press the ball in the wide area. They effectively form a cordon that is shutting off the interior of the pitch from the man in possession of the ball. They have essentially formed a choke point that will force the man with the ball to either try to attack down the wide area of turn back and play towards their own goal. This is a highly efficient defensive technique. Now we see Dortmund when they have fully transitioned in to their attacking phase. They are spread out across the width and depth of the field with Julian Weigl and Ousamane Dembele highlighted in central positions both deep and advanced to effectively act as the pivots through which Dortmund can look to play. In this structure Dortmund have the potential to overload down either flank should the ball be switched to that area. This makes it difficult for the Wolfsburg defence to favour one side over the other in their defensive alignments. When the young French forward signed in the summer from French side Rennes he was ostensibly seen as an exciting wide player who played predominantly on the right. So far this season we have seen Dembele used on the right, left and in the centre as well as in the striker role from time to time. He has impressed in every role despite still being raw both tactically and technically but in this match he was deployed centrally and the opposition simply could not cope. With the ball wide left this shows the chain reaction that the movement from Dembele has on the defensive structure. He drops in to receive the ball from the man in possession and in doing so he drags the right sided centre back out of the back three to cover him. The issue with covering a player like Dembele however is simply that you never know what direction he will move as he is a genuinely two sided player. Here he takes the ball and quickly spins infield driving towards goal. Now with the gap in the defensive structure Dortmund have players like Reus and Aubameyang who have the ability to attack the space at speed to get in behind the defensive structure. Here the key to the attacking movement is the positioning of Dembele as he looks to access the space between the defensive and midfield lines to receive the ball. He positions himself intelligently in a passing lane so that the deeper player can play through the midfield line in to his feet. Once again the defence is left not knowing which direction Dembele will run with his ability to go either way. Players that are this unpredictable in the final third are a defender’s worst memory. 3-0 told the story of the game rather well. Dortmund were efficient and impressive both in and out of possession and the ability to create and access space in the final third kept Wolfsburg constantly off balance throughout. Thomas Tuchel once again showed his tactical understanding by using Dembele centrally to pull the opposition defenders out of position time and time again.